The versatile choice for day or formal wear, the Argyll is tailored in 100% Pure New Wool black barathea, features a plain single button cuff and plaited epaulettes trimmed with chrome plated Celtic buttons. Stocked in UK sizes 38″ to 54″ in Short, Regular and Long fittings. Do not try to measure yourself – ask a friend to help. Take all measurements twice – mistakes do happen. 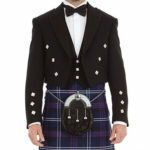 Kilt Waist: Tightly around waist at the navel or up to 2″ above as the waist straps will be holding your kilt up! Kilt Seat: Taken around the widest part of the buttocks. 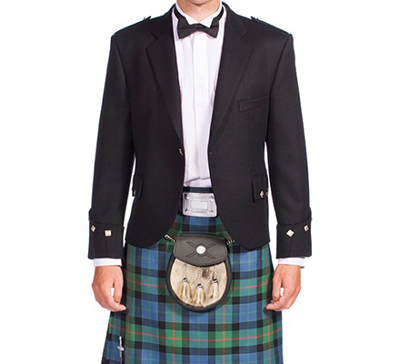 Kilt Length: From the line used for the waist measurement to mid-knee, or top of knee if you prefer, but no lower. This is the entire kilt length. Wearer’s Height: Standing straight in socks (no shoes). If you wish to wear your kilt high on the knee, you can subtract 1″ – 1.5″ from the measurement above (to mid-knee) but we recommend no more.